Pictures of machines with MTNs logo went viral on social media and the narrative was that they were “Mobile Money” ATMs. Most of the discussions online have been around what this may mean for mobile money merchants (or agents). I want to share my thoughts on this issue. From some reports, you realize in actual fact, these machines provide more services than just Mobile Money. The narrative from media reports is that they are “Self Service” kiosks. It’s understandable why MTN may want it to be seen that way instead of it being seen as a direct competitor to Mobile Money agents. The latter makes people who have so far been crucial to mobile money reach a bit anxious about their jobs. Here’s the thing, when you compare the services the kiosk provides which are SIM change, PIN reset and mobile money as against those of MTN Authorized Dealers, you realize they are in more direct competition than agents will be to the kiosks. 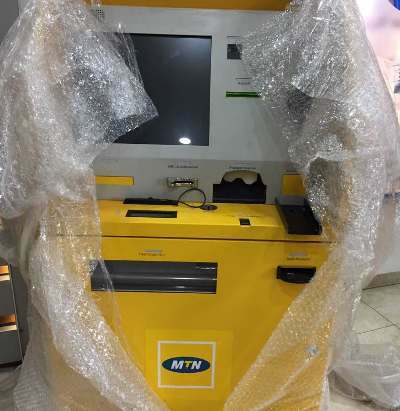 To a large extent, it can be argued that it can reduce traffic to MTNs main shops leaving MTN attendants to work on more complex issues which the kiosk cannot handle. However, mobile money agents provide just one service of that of the kiosk. In the short to medium term, I don’t see these self-service kiosks replacing their mobile money agents especially when other Telco’s like AirtelTigo and Vodafone Ghana have made clear their intentions to expand their agent numbers and so will absorb them. As at December 2017, MTN had an agent base of 85, 000. I do not think MTN will want to replace their agents with these machines. That agent base has more reach than the number of kiosks they can roll out in the short term even if they were direct substitutes. There will be some customers who want the human element in dealing with Telco’s and will visit mobile money agents to do their transactions. The difference now is that; customers have an option of using the kiosk if they’re met with bad attitudes by agents. That’s when good customer care counts. It’s important to remember that, if a line builds up at a kiosk, every customer may be there for a different reason. It could be for SIM change, PIN reset or mobile money. It will not be only mobile money customers who will troop to these machines. Those who may be in the line for mobile money may opt out and visit an agent instead. I see these kiosks as a complement to the merchants. It crucially depends on how MTN incentivizes the machines use. Will lower mobile money transaction rates be offered to customers who use the kiosk instead of doing their transactions at an agent’s desk? These lower rates could be offset with fees that would otherwise have gone to agents. On the kiosk itself, I think the phone on it is a nice throwback to the Ghana Telecom days. Reports suggest that it is being piloted. MTN may realize users of the machine use it for one particular service it provides. Who knows? It will be interesting to see the results of the pilot stage. If MTN does roll it out, it will be interesting to see its growth and impact in the Telecom space.